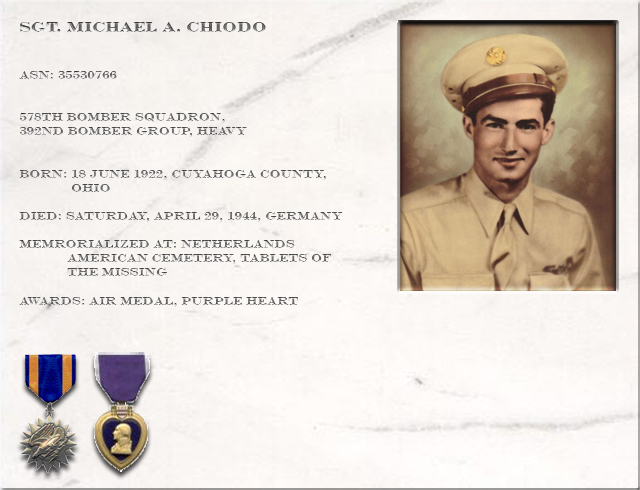 Michael A. Chiodo was born 18 June 1922 to Michele Angelo and Maria Francesca Chiodo in Cuyahoga County, Cleveland, Ohio. Michael was the eleventh of twelve children in the Chiodo family. His parents and the two oldest children were born in Italy ,Michael was named after his father. 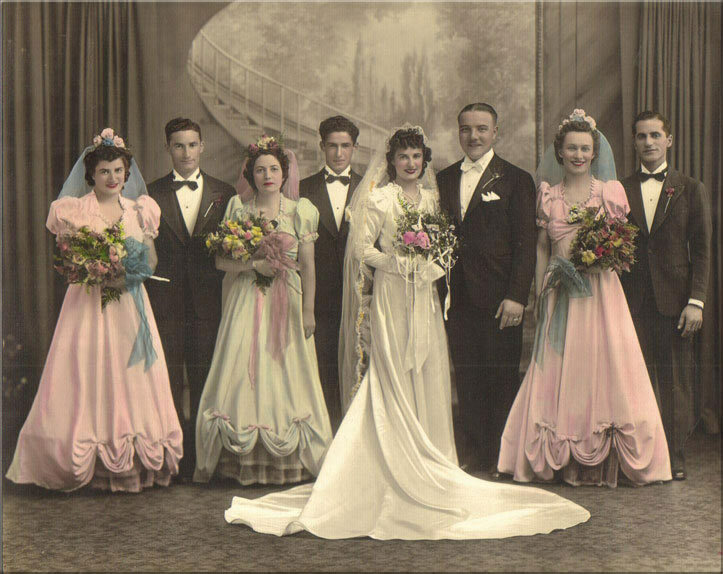 Michael had six brothers and five sisters; Russel (1906), Marie (1907), Arnold (1909), John (1910), Lucy (1911), Adolph (1914), Michelene (1915), Carol (Joyce Wittal's mother - 1917), Frank (1918), Annello (1920), and Rose Ann (1924). 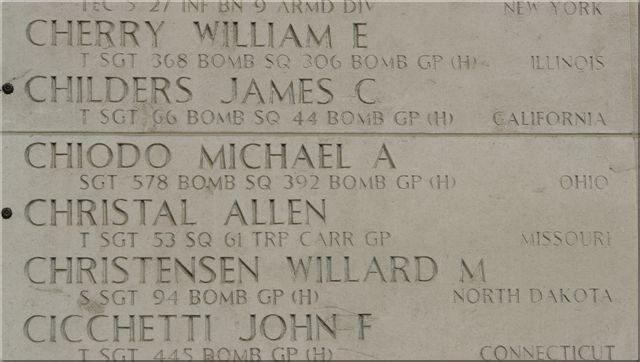 Michael graduated from High School and worked in machine shops and similar occupations before the war. Michael at his sister Carol’s wedding on August 3, 1940. 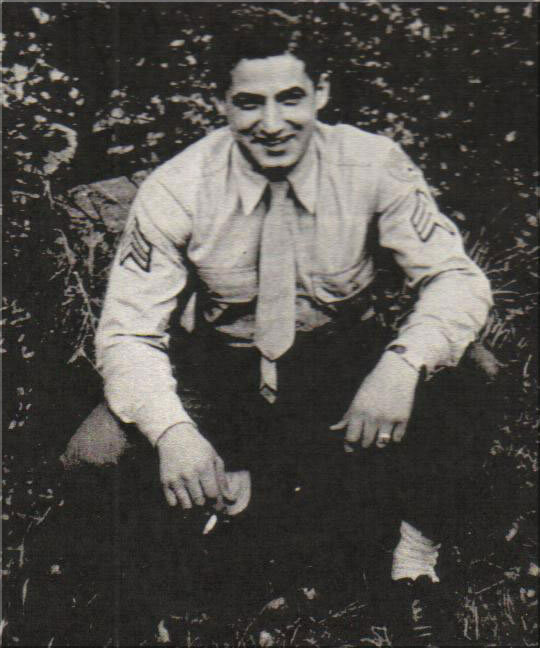 Michael enlisted in the United States Army, Januari 19,1943 in Cleveland, Ohio. 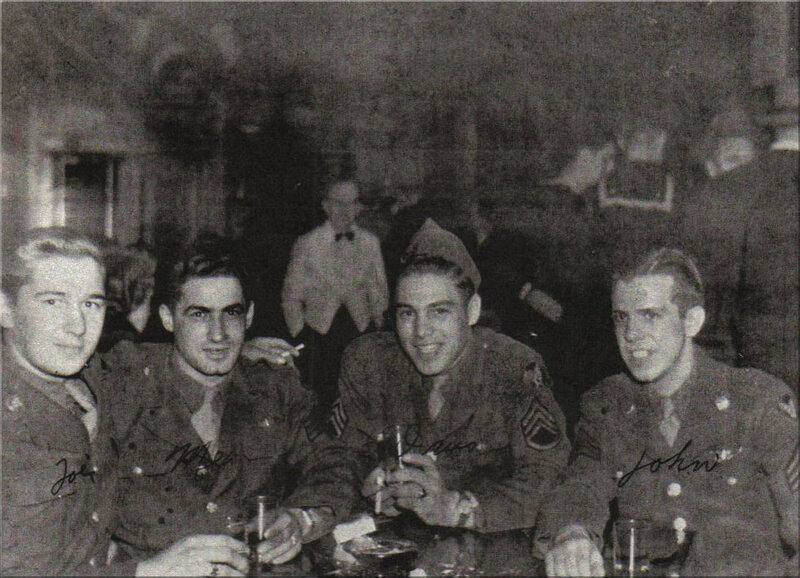 Three of his brothers; John, Adolph, and Frank also enlisted in the Army during WWII. His sister Rose Ann enlisted in the Women's Army Corps during the war. All three brothers were wounded, but survived the war. Michael was not so fortunate. 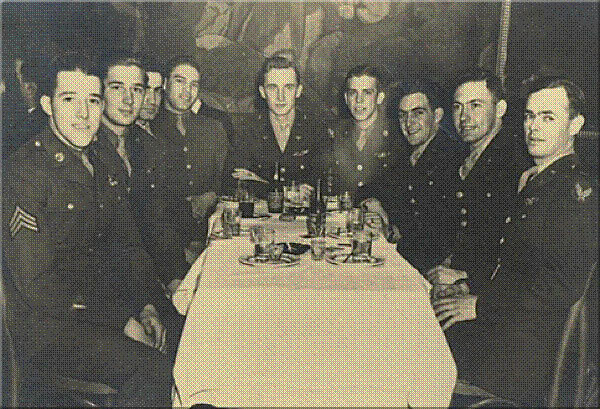 22 year old Michael was a member of the 578th Bomber Squadron - 392nd Bomber Group (Heavy) and was a left waist gunner aboard plane #42-110105, a B-24J Liberator piloted by 2nd Lieutenant Robert R. Bishop. 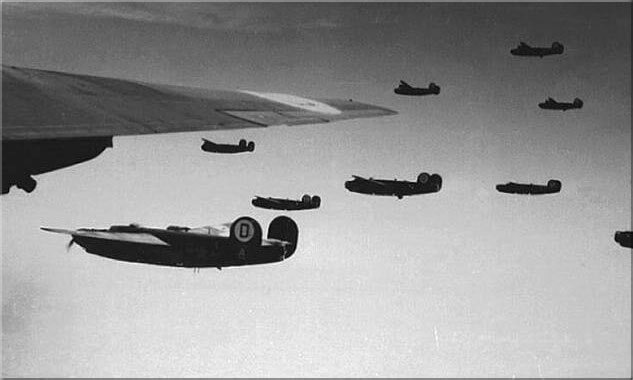 On April 29, 1944 the whole squadron including the”Bishop”B24 took off from their base in Wendling, England for a bombing mission over Berlin at 7:39am. Around 11:03am. It was the crew 10th mission. 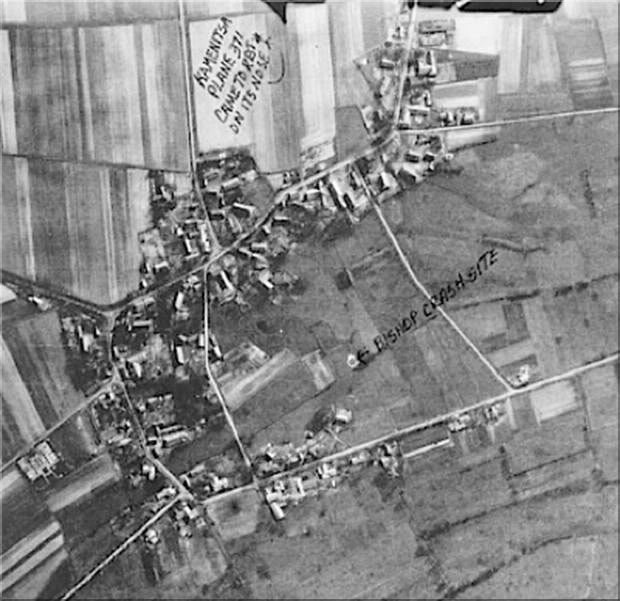 After facing the first attack from enemy fighters, the Sabourin crew reported seeing Bishop's plane pulling away from formation, reporting that "it looked like the right elevator was shot up badly – no parachutes"
Sgt Guillot, Kamenitsa's left waist gunner, remembers that when his airplane came to rest after the crash and the dust had settled, he could see a huge fire and black smoke near a farm house or barn a few hundred yards away. He was sure it was a bomber from his own Group , but as it turned out, the plane was actually Bishop's. 2nd Lt. Arthur Luce (co-pilot), 2nd Lt. Donald Hess (navigator). Not shown: Sgt. James Blong (engineer) and S/Sgt. Ralph McDonald (tail gunner). 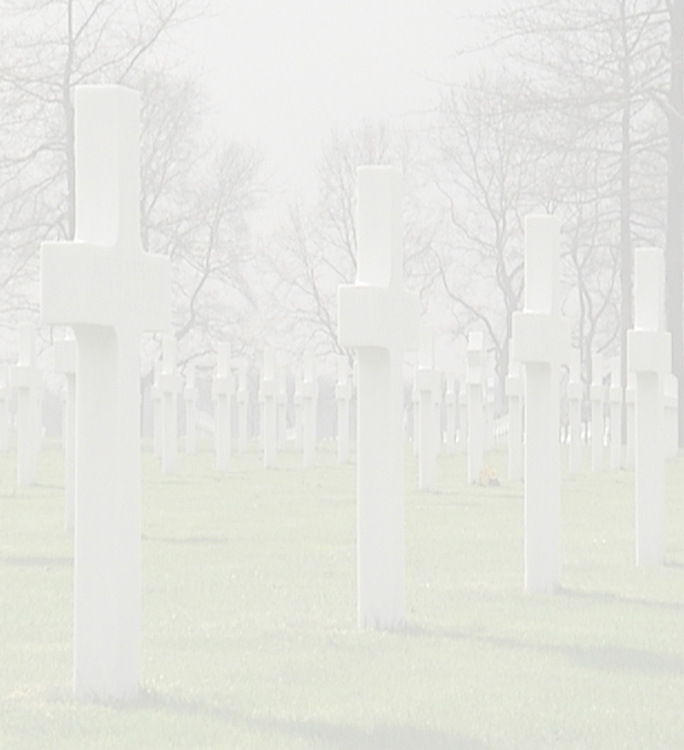 All lost their lives on April 29, 1944 with the exception of Orus Baxter. Michael's niece, Mrs. Joyce M. Wittal remembers... "The family grieved inconsolably for their baby boy. Although I've never met him - I know him through all the stories from my Aunts and Uncles--the twinkle in their eyes and their smile and how their eyes got misty remembering he was not with us." Mrs.Joyce Wittal also tells us... "I meet with the Army contacts every other year for a status update. They do a terrific job with accounting for the missing and in their recovery efforts to find a fragment of bone or a piece of aircraft or uniform. Currently four of my uncle's Crew led by Lt. Bishop have been recovered. My Son and I have both given DNA samples to assist in their efforts. In the 1940's when the boys went to war, there was no DNA, mostly handwritten dental records. Not sure what the future holds because the German farmer, whose property is where the plane went down and two crew member's remains were found refuses to cooperate further with excavation of his property." and by all who knew Michael and his family. for adopting Michael's name on the Wall of the Missing. 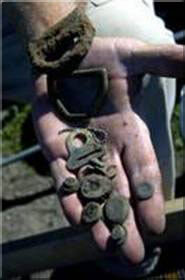 In an October 2, 2005 article in Stars and Stripes, Kevin Dougherty wrote of efforts to recover Bishop's lost bomber and the remains of her crew. 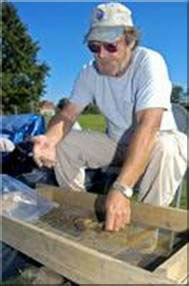 Anthropologist Dr. Gregory Fox sorts artifacts recovered from a World War II crash site of a U.S. B-24J bomber near Mellendorf, Germany. photo’s and text,courtesy “stars and Stripes”.